Be a dancer for the day! Play with colored scarves, hula hoops, and a rainbow colored parachute! Take on a fun and challenging obstacle course. Finish with ballerina hand stamps and curtseys, and the second hour of the party is yours to fill with cake, presents, and any other activities you might have planned. Parties are boy/girl friendly! Parties are held at Soma Yoga in Ballard or at Dance Underground on Capitol Hill. 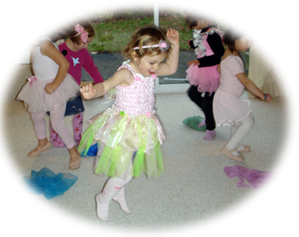 Two hour parties are $250 and include 50 minutes of dance instruction. Dates and times are limited so book early for best availability.